LogicNets use-case frameworks provide powerful packaging options that define your application’s behavior – what it looks like and how users can interact with it. Frameworks are optimized for the unique requirements and skill levels of different users, allowing you to exactly control how and when a user is exposed to information and what they can do with it. 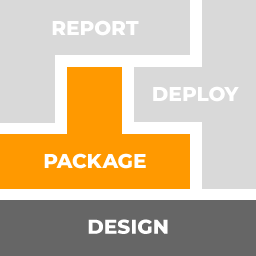 Choose from any of our pre-configured packaging options or collaborate with your IT staff to customize or build new ones with our designer. The Support Center Framework is optimized for interactive diagnostics and troubleshooting applications, guiding non-experts step-by-step through the procedures your experts have developed for optimal handling of customer/user/patient issues. The framework provides your users a central case management portal with one-click access to case-specific information and procedures to help resolve reported issues. Customer history, warranty and product details can be pulled in dynamically from external systems and displayed to optimize incident evaluation and to filter for the applicable troubleshooting and resolution topics. The topics listed are directly driven by your modeled content. You can even connect the user’s device directly to the system to be diagnosed and automatically access unit status information to dynamically display the relevant alarm codes and corresponding troubleshooting procedures. When a diagnostic topic is selected, the system runs the corresponding logicnet model you created with your designer. Here, your expertise guides users through the models you defined in order to reach a resolution point. Information resources linked to each underlying logic step provide the user dynamic access to related instructions and background information at the moment it is needed. Once the user reaches an end-point, the system can aggregate the history log and the computed recommendations into both on-screen displays and downloadable PDF reports. Run any LogicNets application on a Windows device locally. Use our synchronization mechanism to periodically update any instance of your application with newer versions while local data input and usage metrics are uploaded to the central servers. Locally installed LogicNets applications can read in log files from connected devices. The data in the log files can be used in your applications for various purposes such as displaying alarm codes or for driving decision logic. Predict and guide to optimal outcomes. When your applications are guiding users through modeled pathways, LogicNets can track the history of all pathway navigation from the user community and use that to statistically predict the most likely outcomes for a session in progress. Users can review the list of most probably outcomes and skip to an endpoint or they can gain insight into how their use relates to that of the community at large. Responsive UI design makes sure that your applications can be accessed by a broader range of devices supporting users working in different contexts and environments. With LogicNets web services modules you can integrate your applications with external applications and incorporate them into the larger workflow. External data can be dynamically imported and used as part of the decision processing. Results from your applications can be distributed for downstream workflow processing. 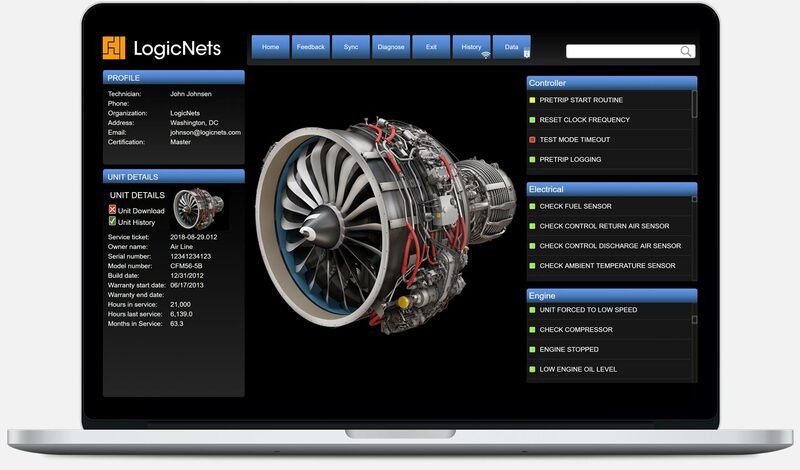 Use the advanced options of the LogicNets designer to customize the look-and-feel and behavior of your applications. Users with an understanding of application development can either add customization layers to LogicNets standard framework packages or create their own. Create applications to efficiently gather complete and accurate information from users and compute and distribute structured output. 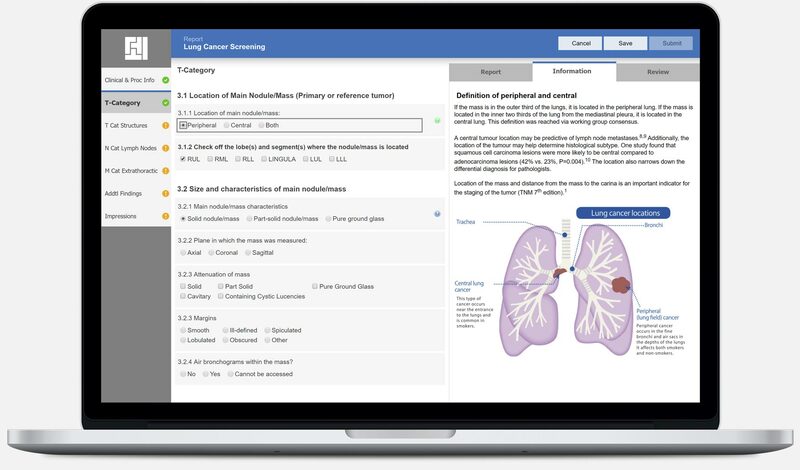 Typical applications include product configurators, advisory reports, action plans and environment assessments, structured medical reporting and more. User productivity is optimized by intelligently and dynamically simplifying data input and allowing users to flexibly select from a pool of questions in any order. As data is input, the application dynamically rebuilds its questionnaires and report displays. The tabs on the left correspond with the “logicnets” or flows you have created in your project. Selecting a tab loads the logicnet and shows the questions to the user in the center of the screen. Whenever a user answers a question, the system traverses your logicnets to see if new questions should be presented based on the path it followed. When resources are linked to question nodes the user can view this information in the right-hand side pane. Each time the user answers questions, reports are dynamically generated and updated in the right-hand panel of the Assessment Framework display. Reports are driven by your modeled logic. Any number of these processes can be implemented to run in parallel, performing different functions such as echoing back user answers or computing results in response to user input. When all the questions are answered, a complete report is presented directly to the user and can be converted to PDF for download. A detailed data export is also available and can be saved off to any other system in formats such as XML or JSON. Data transformations can also be applied upon completion properly formatting data for use in downstream systems (particularly important in Healthcare with standardized code sets). Enable the review tab for users to provide additional information related to specific answers or questions. One or more questions can be selected and paired with the review notes. Users can comment on each other’s reviews to facilitate deeper discussions. Actions can be defined and linked to follow up workflow steps. Deploy your applications across the globe. Input or import any number of language translations for some or all of your content and the system will present or switch application text and linked resources to your users’ preferred language. In healthcare and manufacturing settings, speech recognition is widely used for reporting purposes. LogicNets is integrated with leading speech recognition technology to support voice navigation and free text dictation. Used for diagnostic and treatment protocols, emergency action procedures, and any process where the user needs to see the routing of the proscribed decision pathways. Visually presenting your modeled pathways to users provides additional educational and convenience, allowing immediate awareness of and navigation to endpoints. 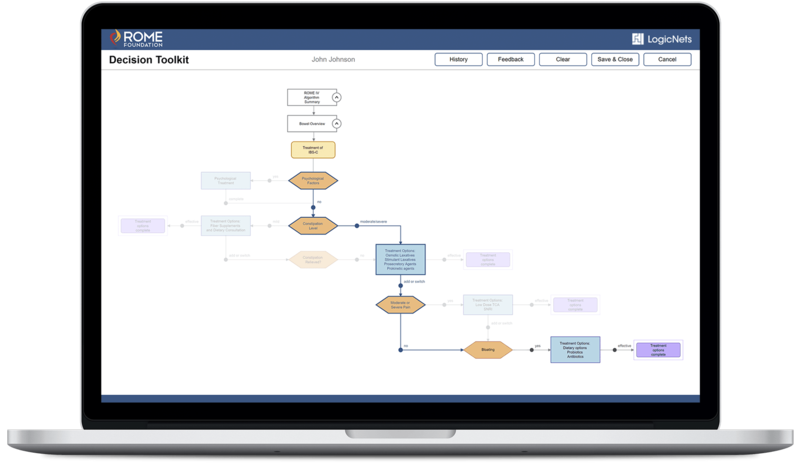 Users interact visually and dynamically with your decision pathways. As users navigate, they can select nodes and a popup dialog presents the available answer options to them. Answered questions along the pathway are highlighted and non-applicable branches are subdued. As users interact with a node, the system presents additional resources in the panel on the right-hand side. Some nodes along the visual pathway may require complex interactions from a user. For instance, a single step for recommending a particular medical treatment option, may require complex input from the user. Calculators allow a visual pathway step to incorporate your modeled logic as underlying drivers whose outcomes can then be linked to the visual pathway. At the end of a pathway a complete history can be presented in the report view. Report results can include any answer, outcomes of calculators and advice that was presented to the user. The final report can also be exported to external systems in a variety of formats using XML or JSON. When connected to external systems, pre-existing data (such as the patient record in healthcare applications) can be imported when the application starts. Questions presented to the user in the pathway will be pre-filled and optionally highlighted if the corresponding data was available in the imported data. In many applications, the user will visually scan a pathway and recognize the end-point they wish to select. The Visual Guideline Navigation framework allows the user to immediately navigate or jump to an end-point in the displayed pathway in order to save time. In this case, the system will backtrack and fill in the answers for upstream questions automatically. The system can be set to optionally have the user confirm these answers as a safeguard when needed. As alternative to popup windows for answering questions, the Visual Guideline Framework can also present form inputs for questions next to the visual pathway display. The two formats for answering questions update in sync with text-based forms automatically completing in response to the highlighting of pathway routes in the visual display and vice versa. Visual pathways can consist of an unlimited chain of your modeled decision flows. Users can page from one flow to another. Or, with Auto-Extend, they can continuously build on the active pathway within a single display.